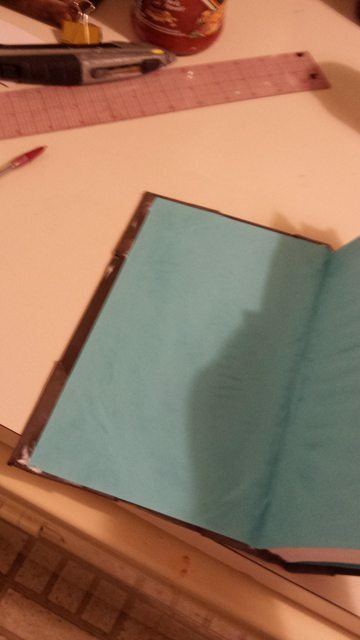 The post last week showed you how to bind your class notes into a book. This week, I will show how to finish compiling your documents with a hardcover bookbinding. I chose to use a different example for my pictures here, as the bookbinding in these photos is more simplistic and instructive. My hardcover bookbindings use matboard as the base material. Matboard can be purchased from a hobby store which provides picture framing materials. The board is cut to size, slightly larger than the paper which it is binding, with a razor and straightedge. Next I use fabric scraps to prepare corners and spine coverings for the book. For a more ornate book, I like to cover the entire matboard with one fabric, then use a second fabric for the corners and spine. However, I want this post to show the bare minimum. It is important to at least cover the corners of the matboard with material when binding a book in this manner, as the material is little more than thickened cardboard and can damage over time. The corners are made by folding a trapezoidal shaped cutout of fabric at the corners. The spine is made by using a strip of fabric to strap the matboard pices together. Sometimes, I use a thicker material inside the spine fabric to improve the spine quality. The cover is secured to the book with at the edge of the spine. A minimum, you can use a piece of gaffers tape to affix this point, but I chose to use colored paper. 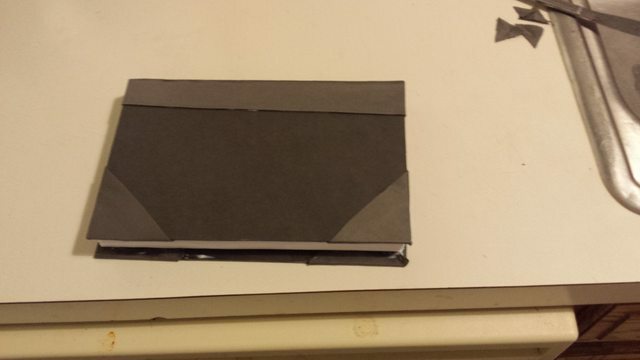 The paper is glued to the the first page with a thin layer of PVA glue, and folded over. The next half is glued to the hardened binding. Note that the pictured example is NOT my best work. This illustrates and experiment I made while coming up with this method. The glue causes waves in the colored paper as it dries. Furthermore, the cover which is thickened by the fabric causes waves as the paper settles into the matboard preferentially. In later work, I have used another layer of material to thicken the matboard to match the fabric thickness. The end result is quite nice though. The cover is substantial enough to protect the materials within, and the cloth hardcover bookbinding adds a bit of elegance to your shelf. In my future experiments, I plan on adding embroidered titles to the spine before binding.